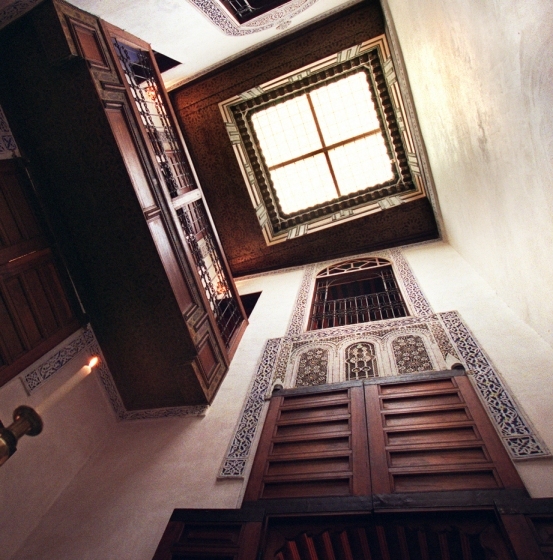 Dar Bennis is a small 18th century traditional Moroccan house in the heart of the Fes medina, on a small street just off Talaa Sghira, the main business street of the medieval quarter of Fez. The house has been carefully restored over the past four years, using only traditional craftsmanship and materials. 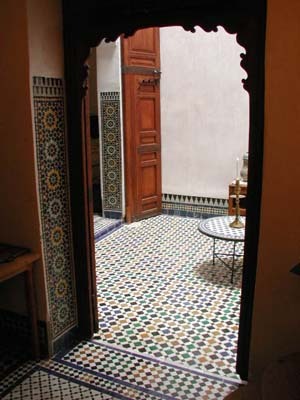 Although a modest house by Fez standards, it features hand-painted and natural cedar ceilings, windows and doors, carved plasterwork, stained glass windows, decorative ironwork, handmade zellij mosaic floors, and a rooftop terrace with an amazing panoramic view of the Fez medina and surrounding mountains. The house is simply decorated, to accent the beauty of the architecture, with antique and handmade furniture and textiles. 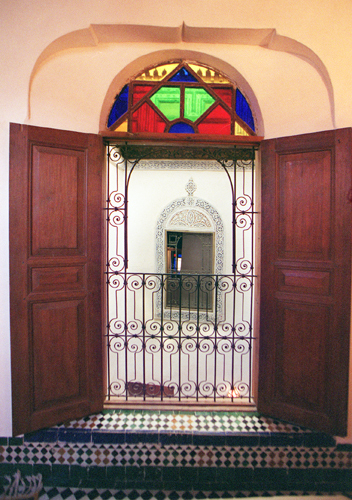 One of the main advantages of Dar Bennis as a holiday rental property, compared to a bed and breakfast, maison d'hotes (guest house), or larger riad, is having the complete house to yourself. 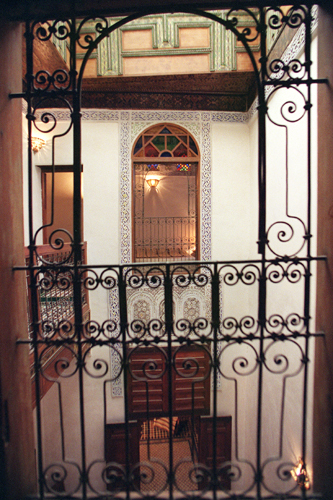 It is also older than most riads and traditional hotels available in Fez, which date to the early 20th century and are located on the outskirts of the medina. Because Dar Bennis is deeper in the medina, the guest gets a real sense of what it's like living in the medina, with its joys and challenges. The house is built on four levels around a small central court. 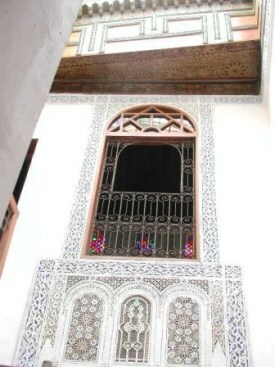 Dar Bennis is technically a dar and not a riad, since a real riad (or riyad) must have a garden with fruit trees. 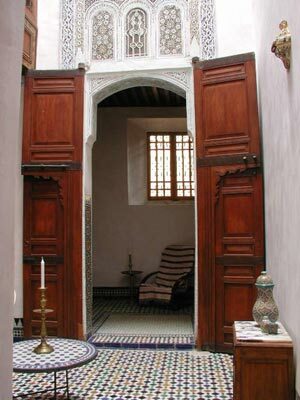 But these days many people call all Moroccan courtyard houses riads. On the ground floor is a large fully-equipped kitchen with hand-hewn ceiling and Italian marble countertops. Up a few stairs is a modern bathroom with floor-to-ceiling handmade zellij. A little further up the stairs and you come to the beautiful central court, which is covered in the rainy season. Around the courtyard are two salons on the first floor and two more on the second. 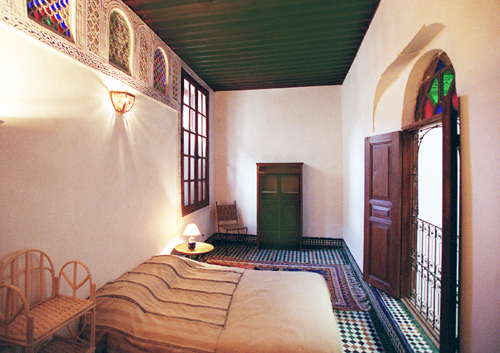 In the two large rooms are double beds, and a single bed in one of the small rooms. The house is cozy enough for one or two people, but large enough for up to four. 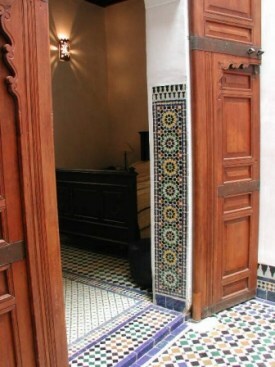 Dar Bennis is an ideal vacation rental for a holiday, or for a longer stay for an artist, writer, or scholar interested in Morocco, Islamic art and architecture, or the medina of Fez. "We know this was the house of Mr. Bennis. The original door knocker says so. It's a typically unpretentious middle-class Fassi home which has been returned to its former modest luxury with tender loving care. Renting this house plugs you straight into street-level life in the medina.